A doctor from Rahoon Road in the city is heading to Chad in central Africa to set up an HIV/Aids project. Dr John Morris (32 ) will work with Nobel prize winning agency Médecins Sans Frontières/Doctors Without Borders (MSF ) on the initiative, one of the organisation’s first such projects in the country. He made history in 2009 by becoming the youngest ever president of the Irish Medical Organisation, a position he held until 2010. MSF has been working in Chad since the 1980s providing healthcare to people displaced by conflict and violence, and to refugees from neighbouring Sudan and the Central African Republic. In the town of Am Timan where the Galway city doctor will be based MSF is supporting the local Ministry of Health in running the district hospital, catering to a population of 190,000. MSF is focusing on improving maternal and child health, running a nutrition programme, and providing outreach support to four health centres in the surrounding area. Dr Morris says preventing mother-to-child transmission of HIV will be a major aspect of the new project he will initiate. He recently worked as a GP in Turloughmore and spent a month volunteering in Haiti during the cholera epidemic there in October/November of last year. He also worked in the Philippines and Australia on short stints. However his assignment in Chad with MSF marks his first time working in a remote location where roads are mainly sand tracks and planes cannot land until goats are cleared off the runway. “I’m very glad that I’ll be arriving in the cold season at least although in Am Timan that means the temperature is around 40 degrees during the day. Still I’ll have time to acclimatise before the real hot season kicks in,” he says. 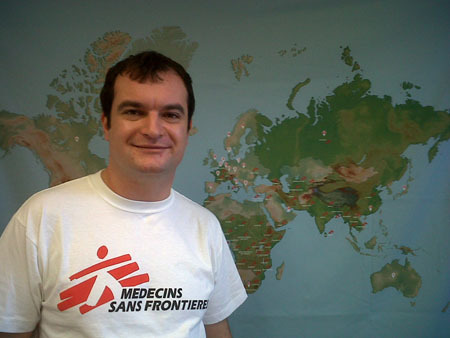 Dr Morris is one of 50 Irish volunteers from a range of backgrounds - doctors, nurses, engineers, accountants, project managers, human resources specialists - who work with MSF across the globe. Barna nurse 27-year-old Aileen Ni Chaoilte has been working with the organisation in the Democratic Republic of Congo since last July. She is originally from Inis Mor on the Aran Islands and is a graduate of NUI Galway. She worked for three years at UHG before moving to London to gain further experience and undertake a diploma in tropical nursing, a requirement for nurses wishing to work with MSF.